This recipe looks complicated, but it is anything but. I love cauliflower puree instead of mashed potatoes. Healthier and tastier. There is no cream in this recipe, and little butter. 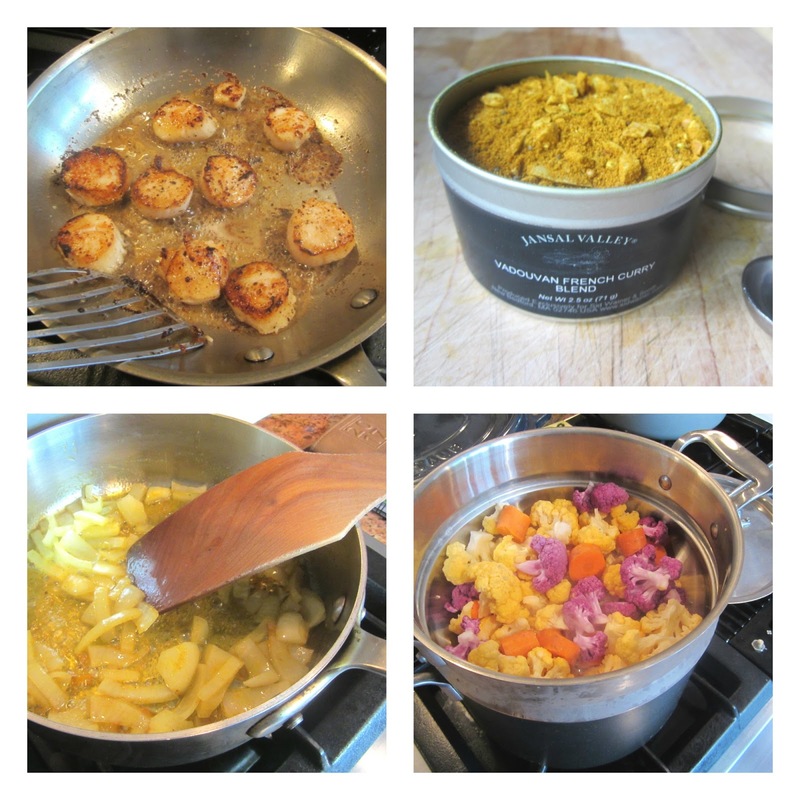 The only fancy thing going on here is the Vadouvan curry......a French blend of Indian curry powder that is of higher quality than the pedestrian quality supermarket curry blends. If you can find it, it is worth the extra $. It is wonderful in yogurts and dips. With eggplant and all veggies. It usually has dried shallots, garlic and masala in it. I bought mine here on amazon, but Kalystan's in NYC has a good blend too. Of course you can sub in a Madras curry or whatever you fancy. 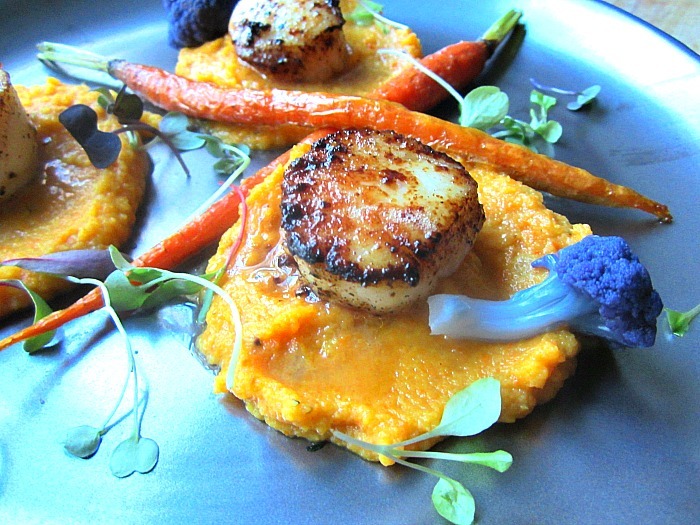 Just go lightly, you don't want the seasoning to overpower the lovely vegetable puree. 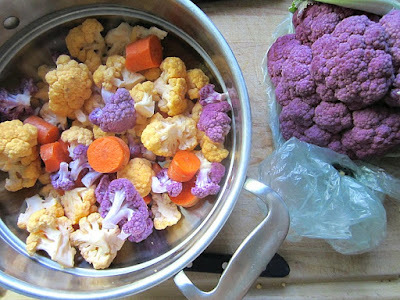 In a steamer basket, place the cauliflower florets and carrot pieces with the lid on. Steam for 20 minutes until tender. In a small skillet, add the butter and olive oil and cook the onion with the Vadouvan curry on low heat only until the onion is soft. You don't want the onions to brown. Transfer the onion curry butter mixture to a food processor with the steamed cauliflower and carrots. Pulse a few times and add in the chicken stock. Season with salt & pepper and adjust to your liking. You can store the puree in the fridge for 2 days. Pat the scallops dry. Season with salt and pepper. Heat a tablespoon of butter in a stainless steel or cast-iron skillet over high heat. When the pan is nice and hot, add the scallops and cook, without moving, for 1 1/2 minutes until nicely browned. Flip and cook another 1 1/2 minutes until nicely browned. Remove the scallops from the heat. 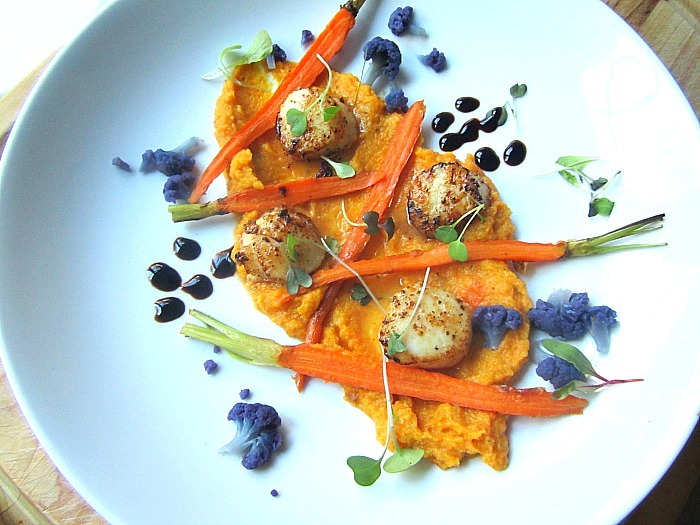 Spoon some carrot puree on a plate. Place the seared scallops on top and garnish with roasted carrots and micro greens. This is great dinner party food. Very impressive.